new design! – Hi, I'm Caroline. In other news, I finally finished up the layout I’ve been working on for the last week! Go see!Â I normally don’t like a three-column layout because it can look crowded, but this layout lends itself very well to blogging and shopping, which brings me to…. … the surprise: I’ve set up a shop at Sixhours.net! 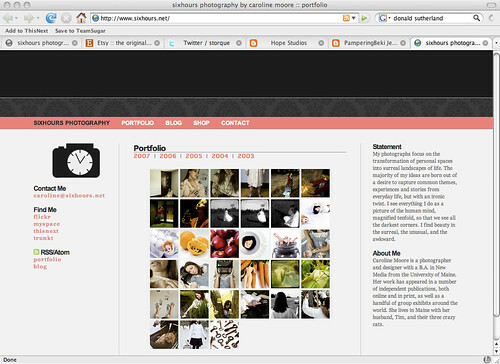 I’m experimenting with Prestashop, an open-source PHP-based Web interface. It was relatively easy to set up, and I think it is easy for potential customers to use. Etsy has been great to me, and I’ll continue to maintain those shops as well, of course. But I’ve wanted to have something hosted on my own domain, too, in the event that Etsy goes down for an extended period of time. I believe it’s sage advice to not have all your eggs in one basket. There may be some kinks to work out, and for now I can only accept PayPal (support for Google Checkout is coming soon), but I look forward to seeing how it goes. I’m sure that, like everything else involved in running a business, it will be a learning experience. I’m interested to see how your website shop works for you. I’d like to do this myself this upcoming year to make it easier for local shoppers so they don’t have to pay for shipping. Keep us posted! Congrats on the awesome check and the book cover. It looks amazing! The shop looks great! Was it hard to set up? Did you need to use MySQL? Very good luck to you on your new shop, it looks really good. I love your pictures. I like the three column layout. It looks great. thank you so much for stopping by my blog… WOW! i SO admire your work. congrats on your shop!!!! that is SO awesome. i’m adding your blog to my link list if that’s okay!! Hey! I like! Great new look… good work! I like your shop site, too. I’ll have to check out Prestashop. Your 3rd column is hardly interfering- it looks nice and clean.